If you have any pictures of events that you would like to share, please email them to office@minburnumc.org. 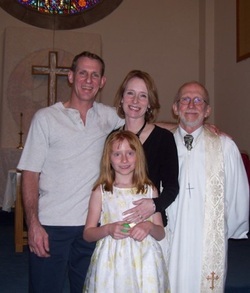 On Easter Sunday, April 8, 2012, Brain and Autumn Welch were baptized into the Faith. Pictured are Brian and Vickie Welch, their daughter Autumn, and Pastor Al. 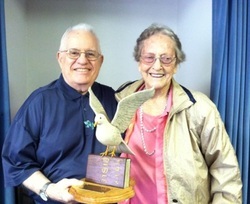 On May 20, 2012, Ruth Goldsberry received recognition for her participation in Adult Sunday School Class. The Dove was made by Bob Peterson. The inscription on the plaque reads: "In Honor Of Ruth Goldsberry an original 1943 member of Minburn United Methodist Adult Sunday School." Pictured are Bob Peterson and Ruth Goldsberry. Pictured are Brent Gibbons and Pastor Al. 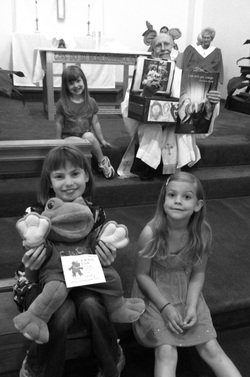 Children having childrens time during service with Pastor Al and "Leafy".